Yanky Rosen is having a hard time in yeshivah. The Gemara is too hard, and he doesn’t want to review with his father or let his rebbe know he didn’t study. All the boys in his class are learning, but Yanky just can’t concentrate. To forget his difficulties, Yanky escapes to the attic, where he finds an unusual treasure. Will his amazing discovery help him solve his problems? 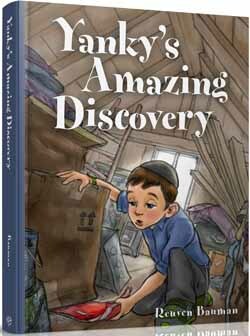 In this first-of-its-kind book by Reuven Bauman, young readers will identify with Yanky’s struggles and be inspired with him by the stories of Rabbi Yaakov Kamenetsky.